Casey Schouten started playing volleyball in grade eight. As a multi-sport athlete, he was always looking for something else to try, and volleyball was next on the list. In four years, Casey went from knowing next to nothing about volleyball, to being the number one ranked high school volleyball player in Manitoba. 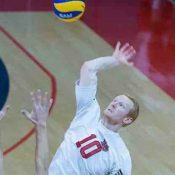 Casey played for Canada’s Junior National Team in 2012, and after graduating high school, the Miles Mac star committed to the University of Winnipeg’s Wesmen volleyball team. Next, he began dominating the CIS volleyball league, and in 2014, Casey was named to Canada’s Senior National “B” team. Casey’s biggest accomplishment to date was just last year, when he was selected by Team Canada to play with the Senior team in the 2015 FIVB World League. Looking back, Casey has no regrets in choosing to diverge from his siblings’ love for basketball, which they both play at a high level. His favourite part about the sport is the combination of technical and physical skills and attributes that it demands from players on a daily basis. Now 22, Casey’s next goal is to represent Canada at an Olympic Games.